Effective communication is at the core of success in business and in life. Work situations often require us to communicate under pressure—to perform—and if we can’t connect to other people with passion, energy and animation, it’s just more talk. Laurie Burton Training takes business communications to the next level by teaching groups and individuals how to express themselves powerfully and authentically—the essence of a strong performance. Some people think, “Communicating is just saying what I want to say.” What gets left out of this equation is the impact you make—how well the audience receives your message. 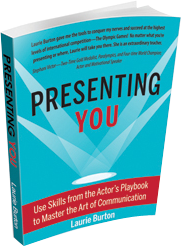 Laurie Burton Training teaches business people the same skills actors use to create dynamic, whole-body presentations. Call us to book one-on-one coaching sessions or schedule a team-building workshop.